Want to improve your Spanish pronunciation and reduce your accent? Discover how to pronounce the basic sounds of Spanish, improve your speaking skills and sound more natural. Whoever says the opposite, lies. They’ll sell you the idea that you need to improve your level of Spanish before you can understand and speak confidently. You’ll waste a crazy amount of time and energy studying grammar structures that you’ll rarely make into action. You’ll learn lots of vocabulary, thinking that’s what you need to speak Spanish fluently, with confidence. And I wonder what do you want a B2 level of Spanish for, if you aren’t able to have a conversation with a native speaker or to pronounce clearly words from A1 level? You’re good at reading and writing; maybe you’re even able to speak fast. But you don’t speak clearly and people don’t always understand you. That means that your problem isn’t a lack of vocabulary or grammar but a real problem of pronunciation and accent. A correct pronunciation leads you to speak fluently and automatically encourages other communication skills, such as comprehension and writing. An average English speaker has around 14 broken sounds when speaking Spanish -this means that you probably mispronounce 1 out of 3 sounds you say. 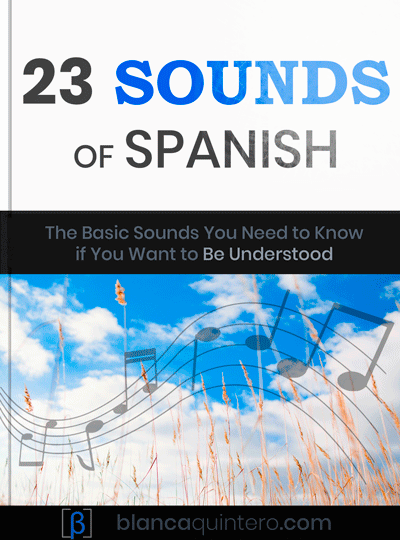 «23 sounds of Spanish» contains the foundations of Spanish pronunciation and mouth positioning. A vital guide if you want to understand and to be understood. Specially tailored for English speakers. Explains the mouth positions for each sound. Exercises to put into practise what you've learned and the answers. Includes audio files and images. Read it online or download it in PDF file. Would you like to fix your broken sounds? Would you like to speak Spanish naturally and with more confidence? Would you like to understand Spanish natives better? Now the guide is 100% FREE. Hice algunas lecciones de pronunciación con Blanca y ella es una maestra increíble. Las actividades estaban muy útiles para identificar áreas en las que yo necesitaba ayuda y sus explicaciones estaban claras. Es una maestra muy paciente y divertida y la recomiendo mucho si necesitas ayuda para mejorar tu pronunciación en español. No sabía que pronunciaba mal palabras básicas, como "puedo". Me gustan las actividades porque son muy entretenidas y su consejo es muy útil. Mi pronunciación es mucho mejor ahora y ya no tengo vergüenza cuando hablo en español. Soy español, pero desde pequeño pronuncio palabras con las letras D+R (padre, piedra) de forma forzada. En menos de 1 minuto Blanca me dijo cuál era el problema y cómo colocar mi boca para pronunciar esta combinación fácilmente. 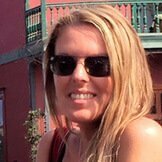 I’m Blanca Quintero and I help demanding English speakers who want to improve their Spanish pronunciation and reduce their accent, in order to speak Spanish fluently, clearly and with confidence -even if they don’t have much time or an advanced level of Spanish. The Spanish alphabet: 27 letters, 5 vowels, 37 sounds – Tips to pronounce like a native speaker When we study a foreign language we start by learning the alphabet so that we can spell the words. However, very few of us learn how to pronounce each sound of the new language. You might have heard that, in Spanish, we pronounce the words as they’re written. But it isn’t totally true. How to pronounce the letters B and V in Spanish? Lots of kids have spelling problems with the letters B and V because they sound the same in Spanish. They can be pronounced in 2 different ways and none of them is exactly the same as in English. Hiatus works differently in Spanish and in English. Learn when you should pronounce the vowels in different syllables.